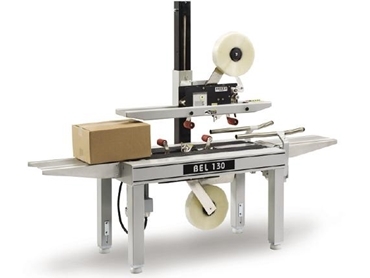 Live Industrial presents the BEL 130 semi-automatic tape sealers capable of taping up to 30 cases per minute. The BEL 130 quick change semi-automatic case tapers feature a slim profile, heavy gage welded structural tube frame that enables easy access to the bottom tape head. The one-piece modular design drive system is easily removed from the machine frame for convenient bench service. BEL 130 quick change semi-automatic case tapers are designed for easy case change with a self-centring width adjustment and counter-balanced upper assembly incorporating a single lever clamp to reduce size changes into seconds effortlessly. The BEL 130 is equipped with state-of-the-art DEKKA High Performance tape heads that are easily loaded in or out of the machine in 30 seconds or less. The BEL 130 quick change semi-automatic case tapers can be integrated with a BEL 505 case former, A32 accumulation table and KDF box stand for a complete solution.